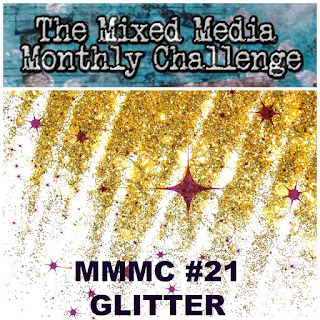 Creative Juice: Mixed Media Monthly Challenge #21 – It's all about the glitter! 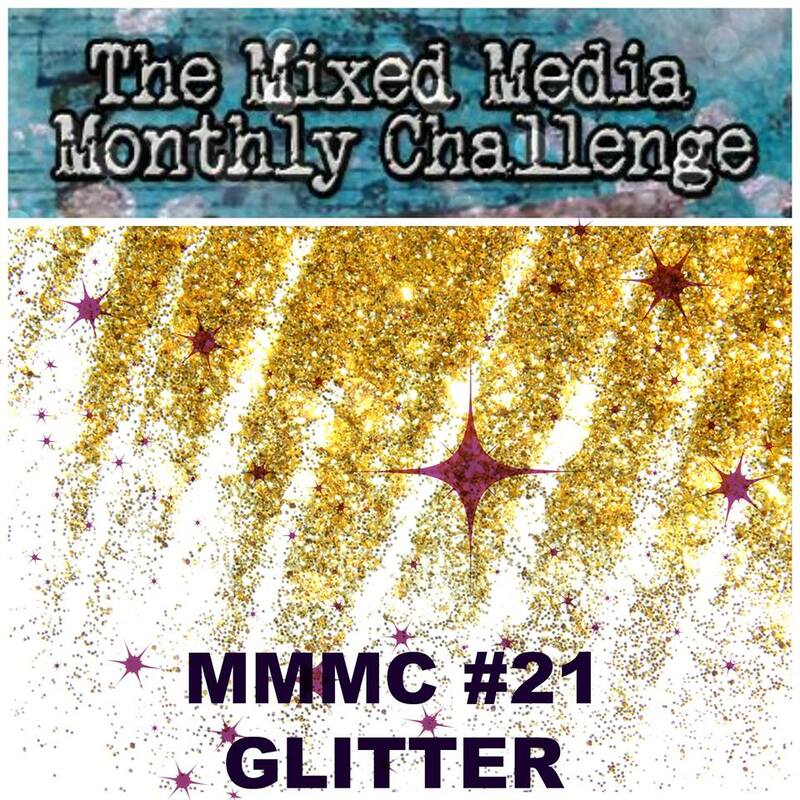 Mixed Media Monthly Challenge #21 – It's all about the glitter! This month the challenge sponsor is Frantic Stamper which happens to be one of the only U.S. retailers of the U.K. based Paper Artsy products. The MMM design team got a chance to play with some of their Fresco Paint and I must say it is cool stuff! To start, I covered the front of my binder with three layers of black gesso (letting it dry in between layers). 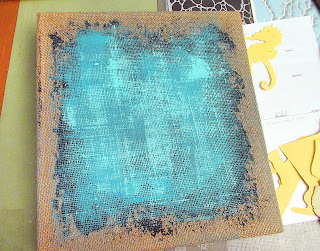 I left it "rough" around the edges to blend out into the burlap. The burlap was so coarse that the extra layers were necessary to smooth out the central area a bit and fill in some of the texture. 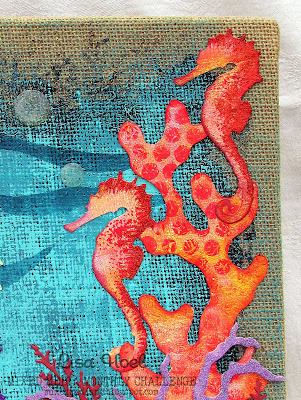 After that I used a sponge brush to add a layer of Captain Peacock Fresco Paint and then a highlight layer of Caribbean Sea. 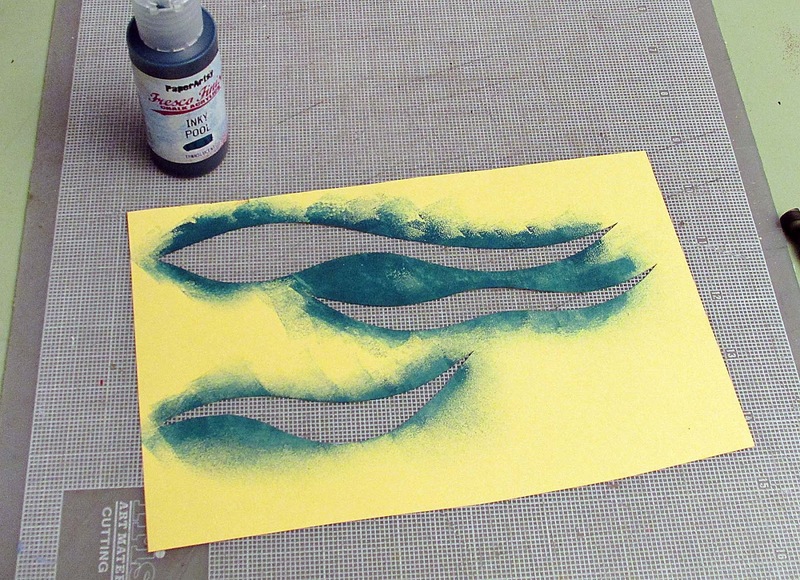 I hand cut a swoosh stencil out of cardstock and used it to stencil the wave shapes with Inky Pool. cutting into the "good stuff". 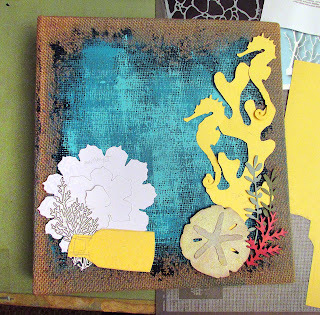 Speaking of "good stuff" I created some "custom" paper to use for the anemone, coral and seahorses. Paper Artsy has several instructional videos on YouTube; I used the easy brayer background technique for mine. 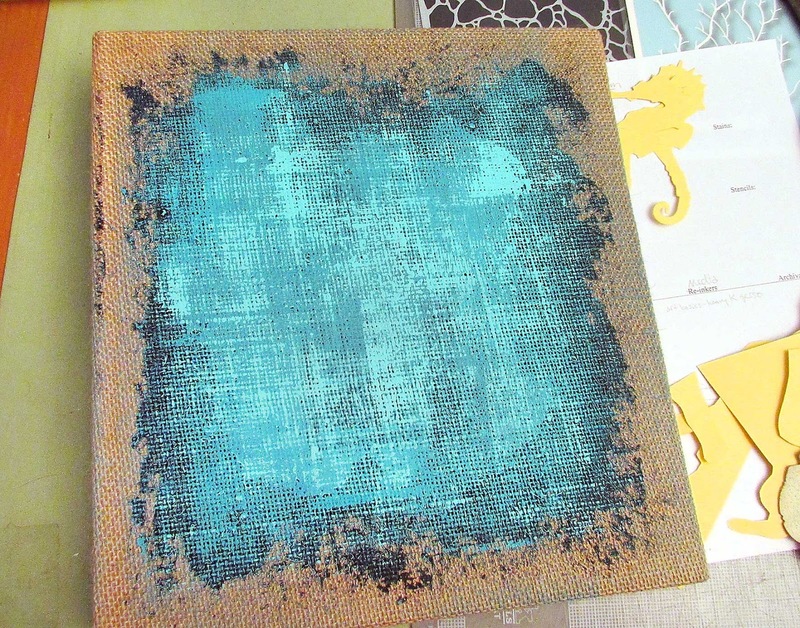 I love the texture and color blends you get! 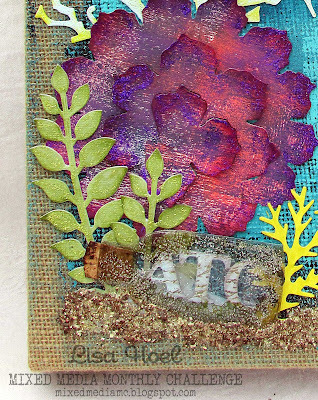 For the coral branch, I also added texture by stamping with bubble wrap. 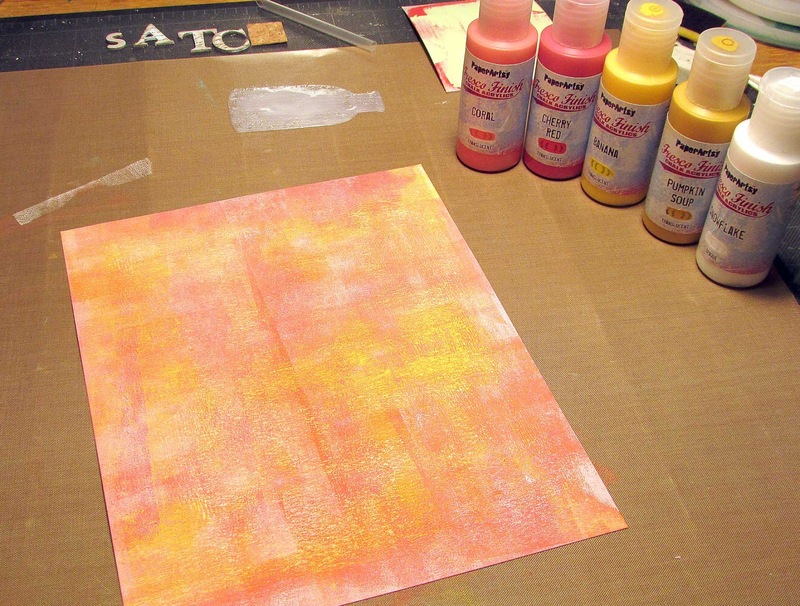 I just wrapped a rectangle of bubble wrap around one of my large acrylic stamp blocks and used a brayer to apply paint to it – then stamped onto the coral piece. It adds another great textural layer. The bottle is cut out of scrap plastic packaging covered with Rock Candy Distress Crackle Paint. The trick to using the crackle paint on plastic is to first lay down a base layer of Glue 'n Seal or Multi Medium (let it dry first). Otherwise the crackle paint will flake right off the plastic. I added a bit of Pumice Stone Distress Glitter around the edges while the crackle paint was wet (keeping up with our theme you know). After the crackle paint was dry, I dripped a bit of Mushroom Alcohol Ink around the edges to age it and define the cracks. Are you still with me? Of course I incorporated all kinds of glitter (which is so hard to capture in photographs). I used coarse Art Ingredients Glass Glitter for the sand, different colors of Stickles Glitter Glue all around and dry glitter for the seahorses and purple coral branches. I managed to get a photo that shows a bit more sparkle, in person it really shines! I hope that you'll head on over to MMM and check out all the inspirational projects my teammates have created for the challenge. If you link up your project there you'll be in the running for a $25 gift certificate from our sponsor this month, Frantic Stamper. We'd love to see you there! Beautiful. The texture is amazing and your glitter is so perfectly used here. Great job! Oooooh! Loved this and so glad you posted the link to the video for the background - had fun watching that! Your project is just colorful, and happy! Beautiful! Thanks for sharing! Beautiful project Lisa! Love the underwater scene that you created! Love the sea theme, so beautiful! 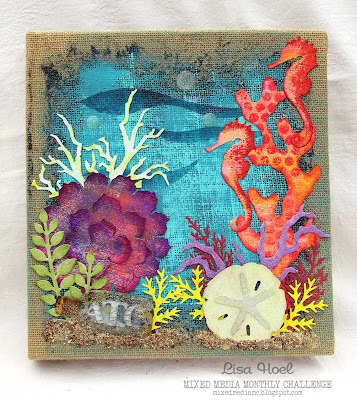 What a fun under the sea card! All your elements are fantastic! Great bright colours for this season: we need them! I love the canvas and all the details you added. 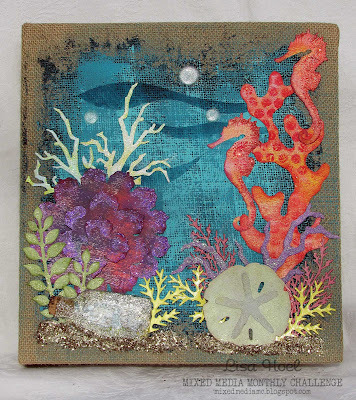 Gorgeous under the sea inspiration! 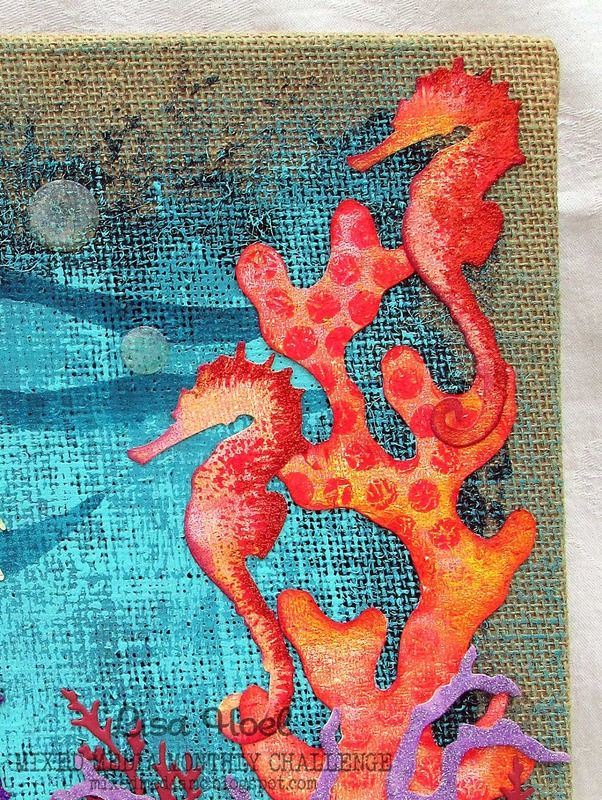 Love the layers of the seaweed and the sea horses! Loved the Corals and the Anemone . What caught my fancy was the bottle with ATC named on it.. Never imagined its an actual plastic bottle .. The Cover is wonderful ..
Love all this texture! The colors are so yummy too. We have similar tastes in dies...I have many of those too. Beautiful project, Lisa! 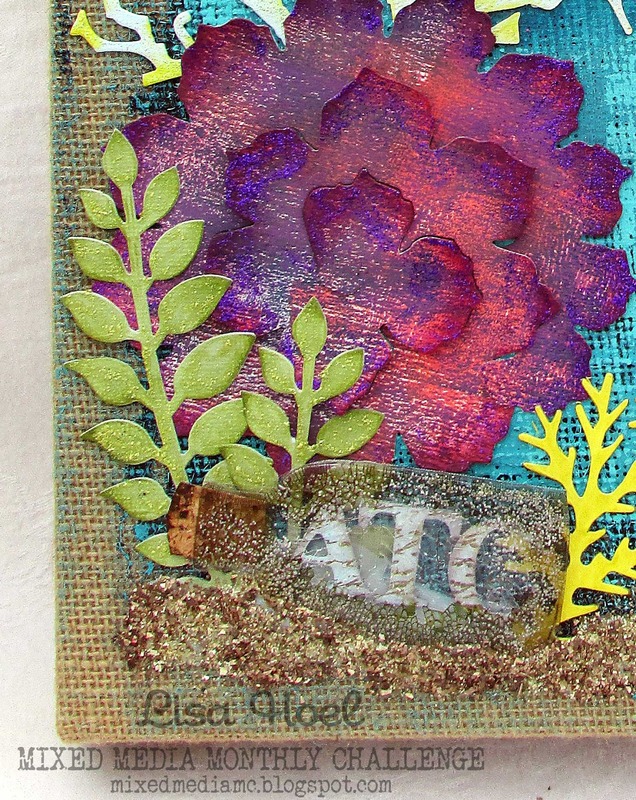 Blog Hop with Eileen Hull & Stampendous!